The perfect lapel microphone rental for wireless voice recording directly into your video camera. 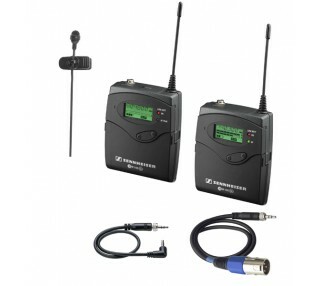 The Sennheiser Evolution G2 wireless lapel microphone rental is fully battery powered, including its lapel mic transmitter and camera-mounted receiver. This makes it ideal for field video shooting applications, and videographers rave about the unit's reliability and frequency range. This lapel mic package comes standard with a lavalier microphone, transmitter bodypack and camera-mount receiver.